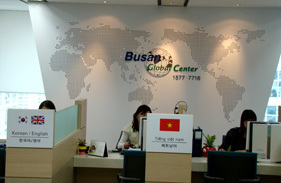 The BFIC provides free interpretation and translation services to foreign residents, accompanies them when they visit public institutions and hospitals, and helps them settle more effectively in Busan. Who qualifies: Foreigners residing in Busan who visit public institutions (such as Busan City Hall, community centers, multi-family support centers, regional labor administration offices, and employment support centers) and hospitals in Busan. The interpretation and translation services are provided by volunteers who are not specialists. People making use of their services do so at their own risk.